Opening morning was spent in Elbert Cty. on a hardwood creek bottom with more hog sign than deer sign and 0 game spotted from 6:35-9:45. That afternoon, I sat from 5:35-7:55 on a durana/chicory plot that is in the middle of a 4 y/o clear cut with both grapes and early dropping persimmons, but once again I did not see a anything. Sunday the 14th was spent with the family and preparing my son's food plot which will be the spot of his first kill. 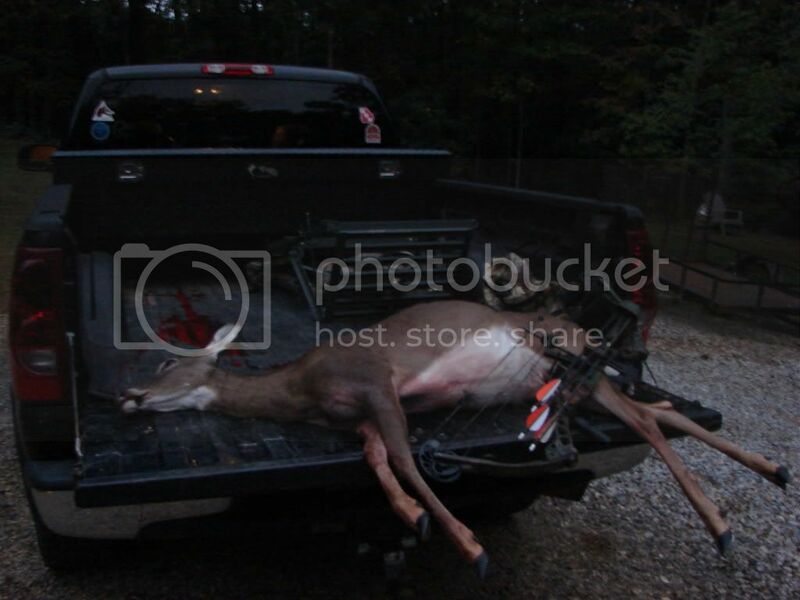 Sunday the 21st I hunted in Oconee Cty. and was overlooking the bottom of a 5 acre pond that is surrounded by three different hard wood ridges. At 7:15, I saw a 6 point that was begging to be killed and he stayed under and around my stand for 15 minutes and I even drew on him, and then let him walk away no worse for the wear. This place has become one of my favorite stands and when the white oaks start dropping behind me in another week or so, this place really funnels the deer. I was in the stand from 6:35-10:00 and he was the only deer I saw. That afternoon I was back in the same stand and at 6:05, I saw a button buck that once again was screaming to be arrowed and after 17 minutes of feeding around me, he finally walked off, I hunted from 4:00-7:55. Wed. the 24th, extremely breezy whcih made for a tough morning hunt, I zero'ed on sightings from 6:45-9:25. I changed stand sites to a hardwood ridge that is just now starting to drop acorns and once again I zero'ed from 5:00-7:55. TOUGH DAY IN THE WOODS TODAY! At least you got out & gave it a good try. Sorry you didn't see much, but it's coming. Morning hunt in Oconee Cty, at 8:05, I missed teh first coyote that I have seen on this property at 27 yards...shot right under the darn thing. At 8:40 I see a small 8 point walking down the ridge across the draw from me and that is it. I hunted from 6:40-9:45. Afternoon hunt and the acorns are starting to drop a little more but still not a lot of fresh sign...I zero from 5:00-7:50. I was planning on using my ML but after firing it 6 times that afternoon and not hitting crap, I decided to take my bow and head to my favorite stand in Oconee Cty. My hunt started a little rough, I forgot my pull up rope, and dropped my bow, so after going back down the tree sweating like crazy and making sure it was alright, I was set up to hunt at 5:40. The wind picked up and at 6:14, I saw three does (2 good ones and an out of spot fawn) coming up the draw. These deer were very spooky but were heading toward the hardwood ridge behind me. I got to watch them for a while, had plenty of time to stand up and when the second deer cleared a tree at 19 steps, I drew back and let her have it. I saw here run off with the arrow still in her, it hit the opposite leg and broke off inside her but the rage 2 blade did the job and she only made it about 43 yards up the hill. This has been a slow bow season for me, I have only seen 6 deer from the stand (three small bucks and these three does) and I personally consider this a fourth quarter success. Unless I go after some suburban deer, Friday will be my last day that I will be bow hunting because my 7 mag is in a holding pattern waiting for this weekend. Last edited by GAGE : 10-13-2008 at 08:24 PM. Gage? Hello? Where are you?